NEW YORK—To help shoppers get into the generous holiday gift-giving spirit, many individual brands known for their hipster or youthful styles are also slashing prices for Black Friday. American Apparel is offering additional discounts on already on sale items and a 20 percent discount for purchases over $60 in select stores. The deals had one family’s teenage daughter grabbing nine clothing items off the racks. 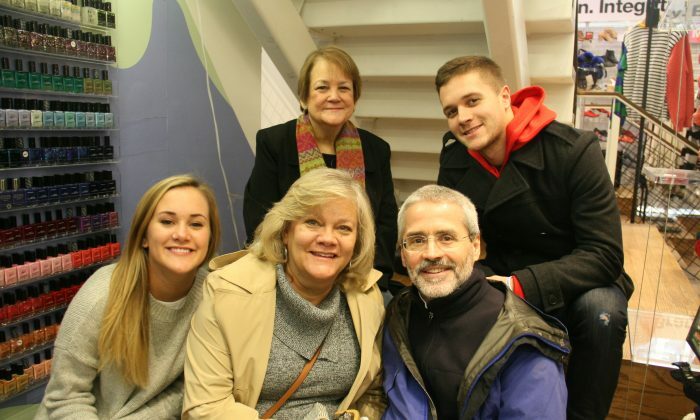 The family of five came up from Arlington, Virginia on Tuesday to enjoy the holiday experience and were heading back on Sunday following Black Friday weekend. On Friday, they planned to stop by a long list of shops, from Urban Outfitters to Macys, Modell’s, Champs, and H& M.
“We’ve already stopped by J. Crew and Anthropologie,” said Mary Dewald, 57, a government federal employee and the mother of two: Robert, 21, and Katie, 19. She was joined by her retired older sister, Maureen Shields, 60, and her husband, Tommy Dewald, 58, also a federal government employee. It was the family’s third year shopping on Black Friday. Ever since Robert began attending Rensselaer Polytechnic Institute in Troy, New York, the family has made the trip to see him and enjoy great deals. In previous years, they scored a Northface jacket at Macy’s for about half off. After a long wait for Katie, where the rest of the family sat down by the stairwell of an American Apparel store in Chelsea on Friday, the daughter finally emerged victoriously with her goods. “This is typical,” said Mary Dewald in good humor, as she surveyed the selections. Still, shopping at individual stores this Friday may be a lot more relaxing than in malls or outlets where more crowds congregate for bargains. The American Apparel store traffic was slow on Friday midday, giving everyone in it plenty of elbow room.